The Festival of Books began in 1996 with a simple goal: Bring together the people who create books and the people who love to read them. The Festival was an immediate success and has become Southern California's major literary event, now in its 24th year! 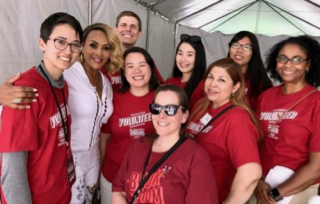 The 2019 Festival will be held on Saturday, April 13 and Sunday, April 14 at the University of Southern California and we would love to have you join us as a volunteer. Last year over 150,000 people attended the Festival, which featured more than a hundred ticketed author events, children’s storytelling, poetry readings, book signings and more than 400 exhibitor booths. The Festival’s success has been due in part to the generous participation of volunteers who welcomed attendees, assisted with registration, staffed author events, supervised book signings and much more. Volunteers sign up for one or more 3-4 hour shifts on one or both days. The majority of volunteer activities require being on your feet for most of your shift. Please wear comfortable shoes and khaki or beige pants or shorts. Volunteers must be 18 years of age or older. (However, volunteers aged 15-17 can attend if they are volunteering along side a parent or guardian). **You cannot bring children under the age of 15 with you during your shift. Volunteers will receive free parking, shuttle service from the parking lot and lunch. We will provide t-shirts for volunteers to wear and keep after the event. After you express interest in this opportunity, we will send you further instructions on how to complete your volunteer registration.